Only $13.99 - $15.99! 50% off! Start shopping HERE! Stock your play kitchen with Yellow Label Kids play food in knit or cloth! Yellow Label Kid's designs make it easy for little chefs to be creative in their kitchen play. Lemon + Cherry Pie Set ~ $13.99 (orig. $27.99) - Pie set includes: 3 slices cherry pie, 3 slices lemon pie, 1 plate. 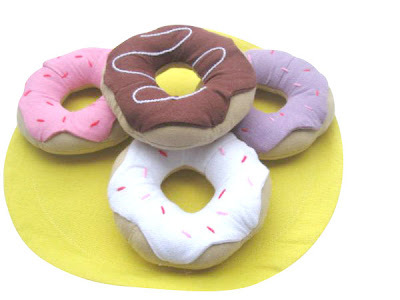 Donut Plate Set ~ $15.99 (orig. $31.99) - Donut plate set includes: 4 donuts, 1 plate.